CenturyLink, Inc. CTL recently announced that it has introduced Cloud Connect Dynamic Connections to provide enterprises with better control over their networks and enable them to seamlessly self-provision connections on-demand through secure portal or application programming interface integration. With CenturyLink Cloud Connect Dynamic Connections, enterprises around the globe can connect locations on its robust fiber network spanning more than 2,200 public and private data centers and above 100,000 on-net enterprise buildings to cloud service providers. Part of CenturyLink’s Cloud Connect portfolio — Cloud Connect Dynamic Connections — is available across many locations in North America, Asia Pacific and Europe, and on Amazon Web Services (AWS), including AWS GovCloud (US). It is delivered over private MEF Carrier Ethernet 2.0 connections across CenturyLink's redundant global fiber network. Notably, the advanced solution provides a fast and flexible network experience, allowing customers to link their data center and cloud environments in real time. It enables creation and deletion of private Ethernet connections to cloud service providers. CenturyLink can now provide on-demand, real-time network connections among enterprise locations, public data centers and cloud service providers globally. With growing day-to-day operations, organizations need a fast and easier way to connect their locations and data centers to cloud service providers. CenturyLink offers a complete portfolio of solutions for cloud connectivity. The company’s global access and extensive Wavelength, Ethernet and IP VPN connectivity options are designed to meet today’s hybrid cloud requirements. CenturyLink provides high-performance connections to AWS, Microsoft Azure, Google Cloud, IBM Cloud, Oracle Cloud Infrastructure, and other leading public and private clouds along with more than 2,200 third-party data centers. CenturyLink continues to expand its fiber-based backhaul services and is focusing on establishing itself as a global leader in cloud infrastructure and hosted IT solutions space designed for enterprise customers. We believe that such coveted service offerings will continue to accelerate the revenue generating stream of the company that witnessed a compound annual growth rate (CAGR) of 20.9% from 2007 to 2017. It’s worth noting that the revenue growth has materially impacted the company’s GAAP net income, recording a CAGR of 12.8% from 2007 to 2017. 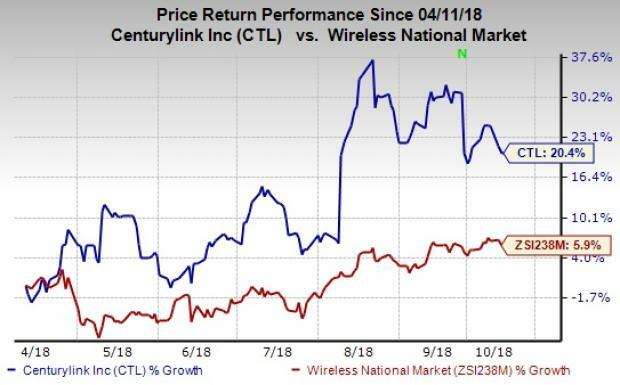 Over the past six months, shares of CenturyLink have gained 20.4% compared with 5.9% growth recorded by the industry. CenturyLink currently has a Zacks Rank #3 (Hold). Better-ranked stocks in the industry include United States Cellular Corp. USM, Cogent Communications Holdings, Inc. CCOI and ATN International, Inc. ATNI. While United States Cellular and Cogent Communications sport a Zacks Rank #1 (Strong Buy), ATN International carry a Zacks Rank #2 (Buy). You can see the complete list of today’s Zacks #1 Rank stocks here. United States Cellular has a long-term earnings growth expectation of 1%. It beat earnings estimates in each of the trailing four quarters, delivering an average positive surprise of 340.4%. Cogent Communications has a long-term earnings growth expectation of 10%. ATN International surpassed earnings estimates thrice in the trailing four quarters, with an average positive surprise of 146.1%.